If the crown fits, wear it …..
You have broken a tooth, a tooth is sore to bite on or maybe you don’t like the look of that dark or misshapen tooth, so you make an appointment with the dentist to have it fixed. The dentists recommend a crown is best for you. (And no it’s not one you wear on the top of your head even though you are pretty special). So what is a crown? A crown is a fixed prosthetic device that is cemented over the prepared tooth. It is not removable & it covers the entire tooth. A dental crowns Gold Coast is often the best way to save a tooth & strengthen it. It can be constructed out of gold, porcelain or a mixture of non – precious metals & porcelain. Now, why did the dentist tell you that you need a crown, why can’t your tooth just be filled, it’s been filled before? Crowns are commonly used for replacing large fillings where there is not enough tooth remaining for a filling to work effectively. They are also used to protect a weak tooth from potential fracture. Every time you fill a tooth that has broken, fractured or decayed, you have to remove a little more tooth structure. This makes the tooth more vulnerable & the filling material that is used to fill your tooth is nowhere near as strong as your natural tooth structure or a crown. 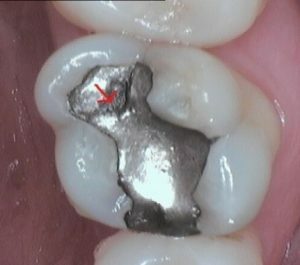 In the image below you can see a big amalgam filling that has a fracture in it. (See the red arrow is). To repair this you would have to remove the existing filling & crack & then replace it with a composite resin material. You can see how big the old filling is, so once you have prepared the tooth it may be even bigger & there may not be enough tooth structure remaining. 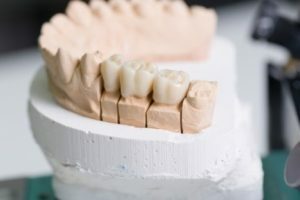 The composite resin (white filling material) that is used is nowhere near as strong as your own tooth, so with natural wear & tear & chewing this filling has the possibility of fracturing again. This is one of the reasons a crown may be recommended. The crown will cover the whole tooth, protecting it. Another reason a crown may be suggested is for cosmetic reasons. It can cover discoloured or poorly shaped teeth & make them so much more aesthetically pleasing. 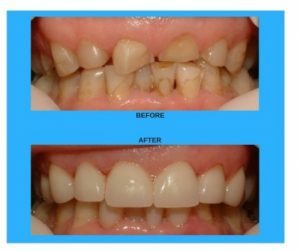 See below a wonderful before & after of a patient of ours. Having this done has made a huge difference to her confidence. Lastly, crowns are used to cover & strengthen a tooth that has had a Root canal treatment. You may have had a Root Canal. This happens when the nerve in the tooth dies. This treatment can take quite a few appointments & is not cheap but necessary if you want to save your tooth, otherwise the tooth will need extracting. Once a root canal has been completed, a crown is then usually recommended to restore the tooth. This is important in order to long-term seal the root canal off from the mouth to prevent re-infection & potential failure. 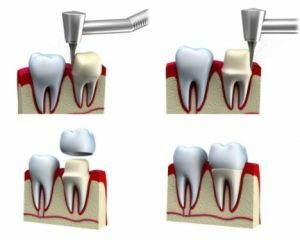 A crown put over the root-treated tooth will also protect it from breaking apart & let’s face it; if you have gone to all that trouble to have a root canal then it is best to protect it. So then, what is involved in getting a crown? Having a crown is not a painful treatment. The tooth to be crowned is drilled down, or a core built up. An impression is taken & sent off to a dental lab where the crown is constructed. During this time a temporary crown will be worn. The dentist will then cement the permanent crown at your next visit. A crown should last for many years. As with natural teeth, it depends on good oral hygiene & regular check- ups & the forces you apply to your teeth. Now you know all about dental crowns, if the crown fits…….. Wear it.